FOREWORD: It happens all too much. A band on the rise loses a member or more due to an automobile (or plane) accident. Chi-town’s Dials suffered that sad fate just as they were making musical progress. Nevertheless, they soldiered on, releasing ‘05s sturdy Flex Time and, after this interview, capricious ’09 follow-up, Amoeba Amore. This article originally appeared in Aquarian Weekly. In the late ‘90s, up and coming Florida band, For Squirrels, were about to shake up the underground when a horrifying overturned van accident killed singer Jack Vigliatori and bassist Bill White. Suffering through similarly grim circumstances, The Dials lost their energetic drummer, Doug Meis (as well as singer-bassist-guitarist Rebecca Crawford’s husband, John Glick, and Silkworm percussionist Michael Dahlquist), in a grievous crash caused by a suicidal motorist. Despite that terrible episode, The Dials chose to carry on with several local friends picking up drum chores part-time. “We’re gonna continue to play shows because that’s what Doug would’ve wanted us to do,” the prematurely widowed Crawford avows. Obsessed with music while growing up in rural Illinois, Crawford was a vinyl junkie who’d lock her bedroom door and go wild listening to new wave and kitsch-y ‘60s girl groups, two stylistic influences now informing her femme-fronted band. “I like catchy music ranging from the Go-Go’s to Joy Division. I was a teenager in the ‘80s and worked at a record store during college, when all that post-punk and power pop was around,” she declares. Now residing in the Logan Square section of Chicago, west of the Wicker Park scene that produced ‘90s lynchpins Liz Phair, Smashing Pumpkins, and Urge Overkill, where “there’s cheaper rent,” Crawford met Miami-bred guitarist Patti Gran through a Chicago Reader ad. The duo settled on a lineup rounded out by Meis and Emily Dennison following the departure of several previous drummers and keyboardists. But just as the foursome began to really click, tragedy struck on July 14th after the recording of breakthrough ’05 full-length showcase, Flex Time (Latest Flame Records), was finished. An earlier EP, Sick Times, done with a former drummer, featured six songs that grew into fruition and got redone for their sterling debut. 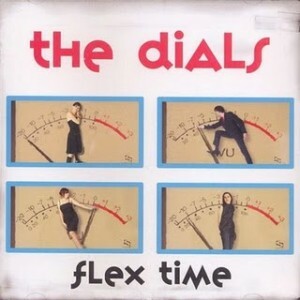 Capturing the attention of fresh fans with exciting gigs cross-country, The Dials feed off each other’s charismatic energy, building to a frothy head of steam by keeping the bustling rhythm strong and the zesty melodies intense. But the impulse to rock out in front of an eager audience has been there for Crawford since she was in an unheralded, but respectable, Wisconsin band. Starting her career with Meis in unheralded Madison, Wisconsin band, the puta-pons, “a more eclectic unit with lots of punk-ish Slits staccatos and artsy Devo mannerisms,” Crawford soon became very confident in the role of front person. On Flex Time, The Dials create fast, efficient, multi-harmonized adolescent punk that vivaciously veers towards enthusiastically sleazy teenybopper pop. Rubbery bass threads through bouncy organ shuffles undercoating the fidgety “Stuck Inside,” meshing alarming Sleater-Kinney-like high-pitched vocal yelps with the same teen dream alacrity new wave drama queens Josie Cotton, Missing Persons, and the Waitresses once brought forth. Dennison’s frolicsome Farfisa drives the electronic space age whirl “Do You Want Me” as well as the snazzy Ramones-fashioned ditty “Bye Bye Bye Bye Baby.” Jittery jingle, “Phone Line,” may be the best phone-related tune since Blondie’s urgent “Hangin’ On The Telephone.” Lamentably ironic, the hyperactive organ-shuttered opener bears the title, “Dead Beat.” Though wholly insouciant, its lyrics eerily ponder ‘where do we go from here?’ In defiance, the only thing the remaining Dials knew how to do was to keep on keepin’ on in the best tradition of fatality-stung rockers. LEFT HAND TWIN SISTERS DOUBLE I.P.A.